Lyle has dedicated more than 36 years of service to the community through his work with HealthEast Medical Transportation. In fact, you could say Lyle is a pillar of HealthEast. He has been an active participant and leader through many changes in the company, community, and profession, all while holding onto and preserving the history and values that remain the foundation of HealthEast. As a Paramedic, Lyle takes an active role in the development of our EMS profession, our service, and our new field clinicians. As a field preceptor, he shares his experiences, consistently demonstrates professionalism, and collaborates with leadership. Most importantly, Lyle centers our team. 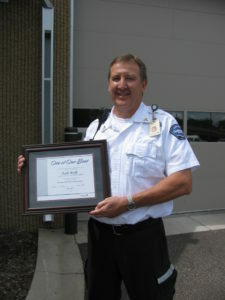 He mentors our EMTs, Paramedics, and leaders and maintains focus on what is most important—quality compassionate care. Lyle has remained on the cutting edge of paramedicine, embracing new developments in the field. But one thing has not changed during his long career: Lyle’s dedication to the many patients he has served over the years. He often comments, “I have dedicated my life to the care of the sick and injured,” and this comes from the heart. You can see the truth in the statement shining through in his pleasant demeanor and the compassion he shows not only to his patients but to his coworkers as well. His performance has been recognized by his peers with the HealthEast “One of Our Best” awards. He states that his personal goal, inspired by his father, is to be the best Paramedic that he can be, and by his own estimate, he’s got about four more years left in his career to achieve that. Lyle loves spending time with his family, and he values their special place in his life. “God, family, then self,” he often quotes from one of his favorite books, I am Third, by Gale Sayers.